Angus was born in Cooma in 1966 and grew up in a family of four boys on a sheep and cattle property at Nimmitabel in southern New South Wales. At Sydney University, where he was Senior Student at St Andrew’s College, he earned a Bachelor of Economics (First Class Honours and University Medal) and a Bachelor of Laws (Honours). He continued his studies to gain a Master of Philosophy in Economics from Oxford, as a Rhodes Scholar. His thesis was about competition policy. After leaving University, in 1994 Angus began working for global management consulting firm McKinsey & Co. He was made a partner in 1999 and later went on to become a Director at Port Jackson Partners. For many years Angus was recognised as a leading Australian and international management consultant. During Angus’s consulting career - where he specialised in the resources, agriculture, energy and infrastructure sectors – he was a strategy and business adviser to a number of global and Australian companies and public sector organisations. Angus has also founded, advised or invested in a number of small, fast growing start-up businesses, mostly in the agriculture sector. Prior to entering parliament Angus appeared before the Australian Competition Tribunal as an expert economist in the historic Pilbara rail access case, and appeared before the Senate Inquiry into the fertiliser industry. 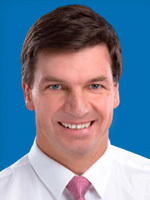 Angus also served on the Council of St Andrew's College for 15 years, and was a member of the Finance Committee of the New South Wales Liberal Party.